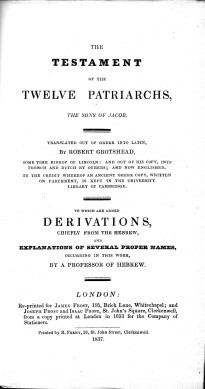 James Frost reprinted this volume, originally from the 13th century, from a 1693 copy in 1837. It was regarded as being canonical. The movements support for this book stems from the comments in chapter 9 of "An answer to William Penn Quaker" that quoted from The Testament of the Twelve Patriarchs with approval by Muggleton. Incidentally the quotes in the Testament from the book of Enoch also led to the acceptance of the Book of Enoch, even in advance of its translation and full discovery by the English speaking world.